Metastatic renal cell carcinoma is cancer in your kidneys that has spread to other parts of your body. It's also called stage IV renal cell cancer. Cancer is harder to treat after it spreads, but it’s not impossible. You and your doctor still have many options. Talk about all your options with your doctor. Find out how each treatment can help you and what side effects it can have, so you can choose the best one for you. Surgery is the main treatment for cancer that hasn’t grown outside of the kidneys. Yet it can still be an option if your cancer has spread. If the cancer hasn't spread far, surgery may be a cure. If it has gone to other parts of your body, you'll also need other treatments like targeted therapy and immunotherapy. These treatments kill any cancer cells throughout your body that are left behind after surgery. Interleukin-2 (IL-2) is a man-made version of proteins that your immune system makes called cytokines, which help destroy tumor cells. The medicine activates your immune system to attack the cancer. Through a thin tube that goes into a vein (IV). You get it in a hospital. As a shot under your skin. You can get this in a doctor's office or give it to yourself at home. Interferon alpha slows a tumor’s growth. You get it as a shot under your skin. It doesn't work very well by itself. Usually you'll take it with another drug, like bevacizumab (Avastin). Checkpoint inhibitors. Your immune system uses a system of "checkpoints" on the surface of your cells to tell which ones are normal and which are harmful. Cancer cells can sometimes use checkpoints to pass as healthy cells and hide from your immune system. Checkpoint inhibitors are a new type of drug that turn off checkpoints to help the immune system find cancer cells. Nivolumab (Opdivo) is one of these medicines that can treat metastatic renal cell cancer. You get it through a vein (IV) every 2 weeks. It can shrink tumors or slow their growth. These medicines target parts of cancer cells that help them grow and survive. They’re designed to kill cancer without harming healthy cells. Anti-angiogenesis therapy. Tumors need a blood supply to grow. Angiogenesis is the process that tumors use to make new blood vessels. Anti-angiogenesis therapy cuts off blood vessel growth to "starve" tumors. One of these drugs, bevacizumab (Avastin), blocks a protein called VEGF, which helps tumors grow new blood vessels. You often take it with the immunotherapy drug interferon alpha. You get Avastin as an IV through a vein once every 2 weeks. Each IV takes between 30 and 90 minutes. Afinitor is a pill you take once a day. Torisel comes in an IV you get once a week. This treatment uses high-energy X-rays to kill cancer cells. Radiation doesn't work very well on kidney cancer. But it might be an option if you can't have surgery. It can also relieve symptoms like pain or swelling. Treatments that help you feel better without killing the cancer are called palliative therapies. Usually, you'll get radiation from a machine outside your body. This is called external-beam radiation. 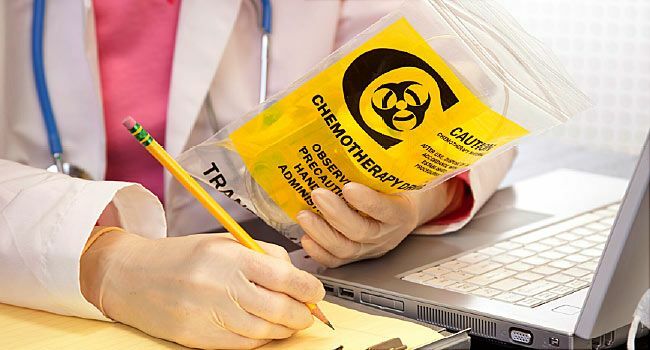 Chemotherapy uses medicine to kill cancer cells all over your body. It can treat cancers that have spread. This treatment usually doesn’t work very well for renal cell cancer. But it might be an option if you've already tried immunotherapy, targeted drugs, or both. Some chemotherapy drugs, including vinblastine, capecitabine, and gemcitabine, help a small number of people with advanced kidney cancer. You take chemotherapy as a pill, or you get it through an IV into a vein. You usually get it in cycles -- a few weeks on, followed by a break. Your doctor will help you decide on the best treatment or combination of treatments for your cancer. If you try a few and they don't work, ask your doctor about joining a clinical trial. These trials test new therapies for kidney cancer to see if they are safe and if they work. Your doctor can tell you if one of these trials might be a good fit for you. American Cancer Society: "Biologic Therapy (Immunotherapy) for Kidney Cancer," "Chemotherapy for Kidney Cancer," "Targeted Therapies for Kidney Cancer," "Treatment Choices by Stage for Kidney Cancer." American Society of Clinical Oncology: "Kidney Cancer: Treatment Options." Cancer Research UK: "Interferon (Intron A)," "Side effects of nivolumab (Opdivo)." National Cancer Institute: "Renal Cell Cancer Treatment (PDQ-Patient Version)." Oncolink: "Interleukin-2 (Proleukin, IL-2, Aldesleukin)." University of New Mexico Comprehensive Cancer Center: "Stage IV Renal Cancer." U.S. National Library of Medicine: "Bevacizumab Injection."